K-MATE, an autonomous surface vehicle control system which is the latest marine robotics innovation from KONGSBERG, is to be integrated with SEA-KIT, a new class of maritime autonomous surface vessel being built by UK manufacturer, Hushcraft, and operated by SEA-KIT International. SEA-KIT can carry a deployable and retrievable payload of up to 2.5 tons. 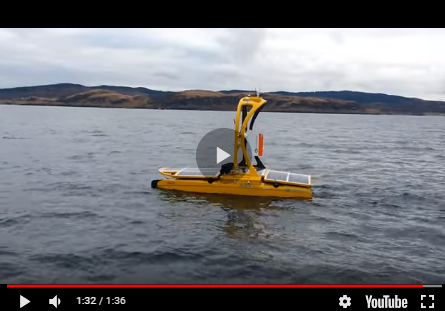 It is based on the AUV-USV concept, which could lead to more efficient, safer and cost-effective seafloor mapping operations, as well as providing a platform for numerous applications in a wide range of maritime sectors. The SEA-KIT vessel provides a next generation, long-range, long-endurance ocean capability. It is able to operate without assistance for months at a time and is the first of a new generation of craft that can truly operate independently. SEA-KIT’s two-system AUV-USV configuration provides the ability to carry a Kongsberg HUGIN AUV. In parallel with these AUV capabilities, SEA-KIT’s hull is designed to have different payloads installed including KONGSBERG’s range of multibeam echo sounders such as the EM302. SEA-KIT also has extended endurance options, making it the first autonomous boat capable of trans-ocean survey operations. SEA-KIT is due to be launched this September 2017. Its first task is to compete in the USD7 million Dollar Shell Ocean Discovery XPRIZE, a global competition with the aim of advancing deep-sea technologies for autonomous, fast and high-resolution ocean exploration. It will be managed by the GEBCO-NF Alumni Team, led by alumni of The Nippon Foundation/General Bathymetric Chart of the Oceans (GEBCO) Postgraduate Certificate in Ocean Bathymetric Training Programme, run at the Centre for Coastal and Ocean Mapping at the University of New Hampshire, USA – now in its thirteenth year. All alumni hold positions in their own countries’ maritime industries. GEBCO is the only organisation with a mandate to map the entirety of the world’s ocean floors.